Just as the 2nd Amendment shouldn’t protect assault rifle devotees, so the 1st Amendment shouldn’t protect vile bigots. The First Amendment does not exist to protect popular speech. Quite the contrary — it exists to protect unpopular speech. The fact that Piers Morgan doesn’t understand a concept that is so crucial to America’s identity indicates that in another life he probably cleaned the king’s chamber pot — and loved every second of it. He carries himself as if he once was a handmaiden to tyranny and it’s carried over into this lifetime. Sadly, he doesn’t even understand how he’s telegraphing for all the world to see that the seeds of an authoritarian monster are alive and well within him. Americans once got to listen to Frenchmen like Charles de Montesquieu. 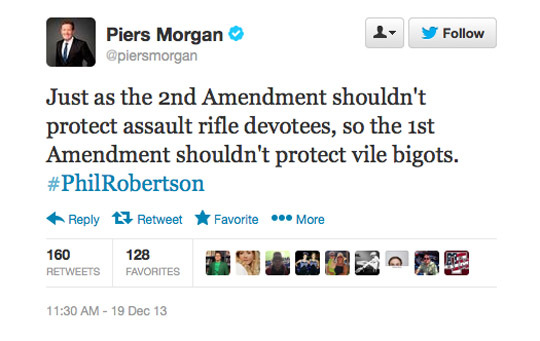 Today, they get … Piers Morgan, who has now demonstrated beyond a reasonable doubt that he does not understand or respect the First or Second Amendments to the U.S. Constitution. Americans once got to read the writings of Thomas Paine, who published ‘Common Sense’ on January 9, 1776. Today, they get to read the Twitter feed of men like Piers Morgan, who compensate for what they lack in common sense with blind faith in their own B.S. What does it say about us that instead of finding this generation’s John Locke that CNN suits settled for the modern equivalent of King George III’s man-servant pooper scooper? Those of the Morgan-mold are obsessed with banning things they do not like. Whether we are talking about physical objects like guns or something much more precious — like ideas — the modern man of the left has a never-ending “to do” list that involves using force to get you to comply with his vision for the world. Whether or not you think Phil Robertson is a “bigot” for his faith in the Bible, one thing is certain: Men like Piers Morgan are a greater threat to freedom and individual liberties than the Duck Dynasty family or their fans will ever be. Piers Morgan? Not only is he filled with hate, but he believes he should have the moral authority to impose restrictions on the kinds of thoughts and feelings that disturb his sensibilities. As usual, Morgan is talking out of his ‘duck call’ again. Perhaps the sound is attracting like minded ‘ducks’ to watch his performance. Piers Morgan offends me can we remove him? No. Do I want him removed? No. Will I listen and agree with him? No. Would Piers feel the same way about me or someone else? No. Who is the real Bigot. Weird analogy aside, I completely agree with you about Piers Morgan. Guy bemoans Constitutional protections which protect his own speech, religious affinity, press credentials, and his right of assembly. He clearly doesn’t understand the intent of the Founding Fathers when crafting the founding document meant to guide our nation then and now. What made me scratch my head was how he, along with a host of television personalities and even a few elected officials don’t understand the basic principles of the 1st Amendment. Now unless I missed something, the Hearst Corporation and Disney-ABC Television Group, owners of A&E Television Networks, LLC, has yet to assume control of our nation’s legislative branch. I’m no Constitutional scholar, but I can’t for the life of me figure out how our government is abridging Mr. Robertson’s free exercise of both speech and religion by A&E’s action of suspending him? Haven’t these talking heads taken a Civics 101 class?